RICHMOND, Va. (AP) - Michael Francis Mara is so mild mannered, authorities say, that even as he was robbing a bank, the teller recalled he "looked like he was somebody's granddaddy" - and yet he has admitted to being a "monster." This week, the so-called "Granddad Bandit" - who often claimed to be a heroic paramedic - met a day of reckoning. The 53-year-old Mara pleaded guilty Thursday in a Virginia courtroom to two Richmond-area bank robberies and admitted to two dozen more heists in 14 states. And some officials suspect there may be more to his past than they will ever know. "I always had a real bad feeling about Mr. Mara because I felt like he could use his mild-mannered appearance as a tool to be able to commit crimes and he wouldn't be a likely suspect," said Robert Lunsford, a former detective who once arrested Mara for a 1995 theft in Chesapeake, Va.
Mara has not spoken publicly since his arrest last August in Louisiana. But in court documents obtained by The Associated Press going back nearly four decades and in interviews with those who know him, a picture emerges of a career criminal who duped those closest to him into believing he was one of the good guys: a veteran, a volunteer, even a paramedic who had helped on the Sept. 11 cleanup in New York City. "If he was an actor, he would have gotten an Academy Award for his performance," his second wife, Patsy Mara, told the AP after her husband's arrest. Even Michael Mara has admitted his lies have made it difficult to keep track of who he really is. "He said through the years he had created so many different identities and different lives that he had taken on that he didn't even know who he was," said Lunsford. In court records and housing applications reviewed by the AP, Mara has listed his hometown as either Syracuse, N.Y., or Green Bay, Wis.
His criminal record goes back until at least age 19, when he went to prison in Oklahoma for theft and bad checks. In the 1980s, he spent five years in a Virginia prison for stealing checks and taking a pistol and radio while pretending to be a cardiac emergency medical technician. His employer found out his credentials were fake and fired him before he was charged. Mara moved to California, got married and had two children. He returned to Virginia, and in 1995 was arrested for breaking into an apartment where he worked as a maintenance man and stealing several items, including three guns. Mara returned to prison until 2004. Mara told police in 1995 about his prior convictions and said he also had been nabbed for three bank robberies and fraud. Court records could not be found to substantiate those claims, and investigators won't elaborate on Mara's criminal history. Lunsford, the investigator in that case, said Mara was polite, cooperative and disarming, and quickly confessed. Mara directed police to his van, where they found police badges, a firefighter helmet and emergency gear, knives and duct tape. Lunsford said a notebook in Mara's van contained a half-dozen backstories. In each, Mara was an emergency worker. The van's windows were tinted dark and the back seat had been removed. There were pictures of random families. "I'm a monster," Mara told Lunsford. "I'm worse than any monster you can imagine. I'm worse than any horror movie." Lunsford said he was never sure if Mara had done something worse or was "just a wannabe." After his 2004 release from prison, Mara lived in a Virginia Beach halfway house. He claimed to be a volunteer with the local marine rescue service, wore a uniform and carried a scanner, which irritated his roommates, said the Rev. William Twine, who runs the house. Twine described Mara as a surly man - "a grumbler, a complainer" - who didn't get along well with others. "Never at any time while he was with us did I have any fear or any suspicion he would do anything criminal," Twine said. "My main concern was him getting along with the people he lived with." 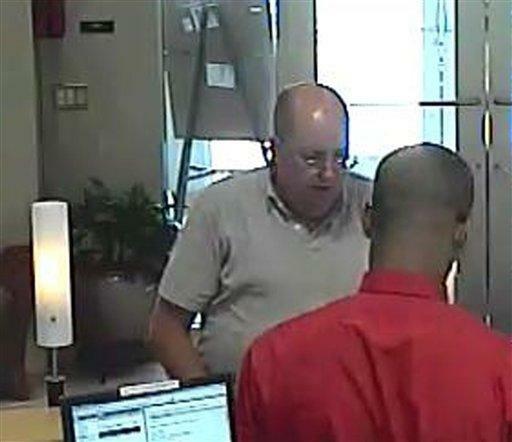 The "Granddad Bandit" bank robberies began a week before Christmas in 2008. Bank teller Annette Kizzie at the Richmond SunTrust told investigators a stocky, balding man with wire-rim eyeglasses and trembling hands handed her a note scribbled on the carbon copy of a check. He wanted $2,000 in large bills and demanded his note back. "He looked like he was somebody's granddaddy," Kizzie told police.Over the next 20 months, the man who became known as the "Granddad Bandit" stole more than $83,000, crisscrossing the eastern and southern U.S. He never used a disguise. He waited patiently in line and handed the teller a note demanding a specific amount - usually a few thousand dollars. Once he suggested he had a weapon, but authorities said there was no indication he ever used one. Police connected the dots last summer. By August the suspect's photo was plastered on electronic billboards nationwide. Within a week, a tipster led them to Mara who, it turns out, is indeed a grandfather. He was arrested after a six-hour standoff at the house in Baton Rouge where he lived with his schoolteacher wife. Mara had met his second wife, Patsy, months before the bank robberies began in 2008, at a shelter for evacuees of Hurricane Gustav in Louisiana. He said he was a paramedic who had helped with the Sept. 11 cleanup in New York City. It wasn't true; he was in prison for the Virginia gun thefts at the time. By the time they were married in June 2009 - he wore his EMS uniform during the ceremony - the Granddad Bandit already had robbed five banks in Virginia, Alabama, Texas and Georgia. Shortly after their wedding, Patsy Mara said her husband claimed to get a job for the Federal Emergency Management Agency working on disaster recovery. In reality, he was working for a vehicle transportation company, a job that enabled him to travel often to other states. When Mara was arrested Aug. 11, federal agents found nearly $4,000 in a black zippered bag and about 15 "demand notes" written on deposit slips. Kizzie, the bank teller during the first Granddad robbery, says she remembers feeling sorry for the man on the other side of the counter. She wondered whether he was on the verge of losing his house or if he just needed money to buy his grandkids a Christmas present. "I'm just glad that he's off the street and he's not putting fear in anyone else's heart," she said.